Time to redo the floors? Confused about what to put down? There was a time when the only legitimate answer was hardwood. But today the options are endless. Here are a few you might want to consider. Cork floors are long lasting, easy care, soft under foot, and a great choice for everything from kids’ rooms to bonus/play rooms to music rooms because of their insulation properties. Whether your style is rustic or modern, there’s a tile product that can transform your home with a chic look, and also keep it easy to care for. 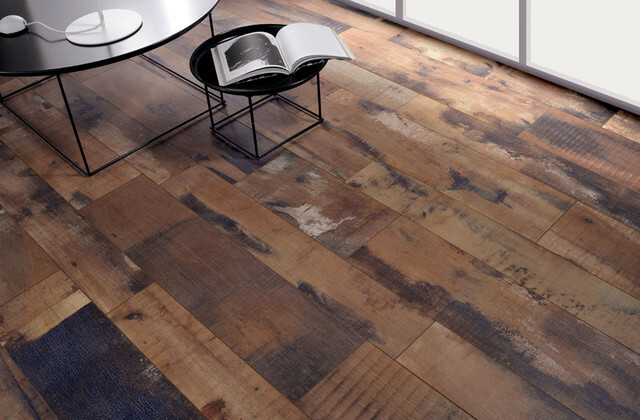 “Manufacturers have gotten so good at creating wood grain-like surfaces on ceramic and porcelain that it’s hard to tell you’re standing on tile unless you look very close,” said Flooring Concepts. “The plank-style tiles take the wood illusion one step further. You can get the look of wood at a more affordable price without worrying about scratches or refinishing. If well taken care of wood grain tiles will look great for years to come. A classic pattern that brings extra interest to the floor, herringbone sets a beautiful foundation for any design style. It takes a little longer to install and requires more product, but the result is undeniable. Have a small space where you can afford to do something cool and different? Just take a trip to the bank. Who knew pennies could be so fancy? The days when vinyl stood for tacky or tired are over. “Vinyl is becoming more a more popular as technology continues to improve,” said Beautiful Designs Made Simple. “Vinyl flooring looks more and more like hardwood or tile and it is more durable than ever. Vinyl floors can offer the look of real hardwood or tile for a fraction of the cost. They also offer easy maintenance and durability. Yes, belts. This cool product from Ting flooring is made from reclaimed leather belts. “The old belts are honed to identical thickness, then glued into panels that can be used to cover floors or walls,” said Houselogic. Forget the large-format stones. At the bottom of the shower, pebbles make your feet feel like they’re being massaged. Why not have that feeling all over your bathroom? You can buy pebbles already attached to mesh for easy installation at pretty much any home improvement store. Or, head to the beach or river and collect your own. Brick used to be a favorite choice for floors but over the years has waned in favor of wood. With the rustic industrial look in fashion and only growing in popularity, it makes sense that it would come back around. Check out some great ideas for using brick flooring here. Want the look of wood planks but on a brown paper budget? Just use…brown paper. “The goal was to create the look of old, reclaimed barn wood, with imperfections and distressing,” said Freckle Face Girl, guest blogging on Remodelaholic. Head over here for a tutorial. Plain old porcelain tile is soooo yesterday. Today’s options use ink jet technology to create standout designs. The same technology that is used to create wood look tile can also create stone and graphic patterns.